Unlike gravity die casting, squeeze casting process require pressure or force to be applied on the molten metal to push the molten metal to fill the heated metallic mold cavity. 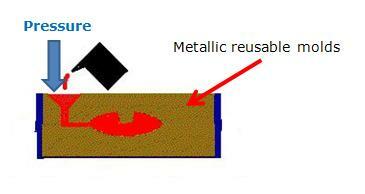 The applied pressure helps proper filling of the molten metal even at the narrow remote corner areas. The pressurized molten even helps to get rid of air trapping. – Good strength due to finer micro structure. Ideal applications: Suitable for small complex shaped mass produced by aluminum alloy and other similar light metal components.